The announcement that Bulgaria’s most prominent intellectual, Julia Kristeva, has been an agent of the communist-era secret services (State Security, DS) and the online publication of her file sparked a wave of controversial comments in the press and social media. Has she collaborated at her will or was she subject to just monitoring by the services? Had she even known she was agent “Sabina”? There is no report written by her in the DS file, and so on. As long as the moral judgement depends on documents that are already available and verifiable, the right thing to do is to read them and quote them correctly, without omitting existing facts or adding non-existing ones. The DS had started operation “Sabina”, had monitored Kristeva, prepared the ground for recruiting her via agent “Kristev” (Vladimir Kostov, a Bulgarian journalist and DS agent, who later became dissident) and agent “Streltsov”, she had been recruited by an officer whom she had trust in and who had received her verbal agreement to cooperate, after which she had been listed as a secret collaborator with the codename “Sabina”. In some documents, she also appears as an “agent”. There are only reports from “Lubomirov” (Luka Draganov), the DS resident at the Embassy of the Republic of Bulgaria in Paris and other agents and officers who have held the meetings with her after the recruitment. Before going to France, Julia Kristeva had been “briefed” by an officer from the Ministry of Interior and had agreed to be “used” by the secret services. Five years later, the same officer, signed as Petrov, had traveled to Paris and had carried out the recruitment “on a wholly voluntary basis, within the framework of her capabilities and in full consciousness, desire and responsibility“. Kristeva had stated her agreement and it appears from Petrov’s report that the recruitment had been on an ideological basis and not on the basis of pressure or making compromises. It had been agreed that Kristeva would keep in touch through “Lubomirov” from the Embassy. The decision to terminate the “Sabina” project reveals the real name of the recruiter “Petrov” as someone named “St. Dimitrov “. There is now mention in the documents prepared by the recruiter St. Dimitrov and in subsequent contacts, meetings and gathering of information that Julia Kristeva is was known to the State Security operatives as agent “Sabina”. As we stated above, there are no reports, declarations and statements written by Sabina. However, there is a document in the broad sense of the term, and it confirms her as a collaborator, recruited on an ideological basis. The file contains an envelope and a postcard addressed to Draganov at the Bulgarian Embassy in Paris. This is the same Luka Dimitrov Draganov, who was the DS resident at the diplomatic mission of the People’s Republic of Bulgaria in France. Using the codename “Lyubomirov”, he had been the one meeting Kristeva periodically and gathering information from her as a careful reading of the second part of “Sabina’s” file reveals. “Lyubomirov” had worked together with Ivan Bozhikov, the lead officer in Sofia, and had also recruited and guided on the field Parisian DS agents such as Tibo and Tomi. 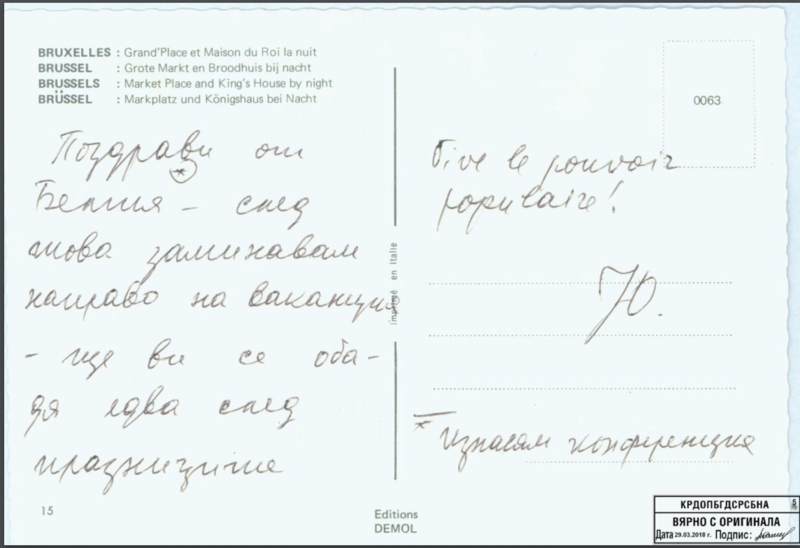 On the card, sent from Brussels to “Lyubomirov” – Draganov, Julia Kristeva has written that she would meet with him after her vacation, as well as a slogan in French: “Vive le pouvoir populaire!” (Long live the people’s power!). This had not been intended as sarcasm. Julia Kristeva actually shared leftist views in her publications at that time, and in particular, she highly valued Mao’s attempt to establish “people’s power” in China. Such reports from Paris had been sent several times to Sofia, and on the basis of them a decision had been made in 1973 to remove Sabina from active duty and archive her file. Yet, DS agents had continued to snoop around Julia Kristeva and to court her relatives for several more years, focusing on her husband Philippe Sollers.